Or perhaps for your dog. Now that the much-anticipated Apple iPad has been announced, we’re getting the obvious and unavoidable question: so what does this mean for chumby? First of all, it’s hardly a surprise that the internet is becoming embedded in more and more products that we use every day. Apple didn’t invent this trend, but they certainly popularized it with the iPhone. So the iPad is, essentially, a bigger and perhaps better version of something they already developed: a gorgeous piece of multi-touch glass connected wirelessly to the internet and to their various “iStores.” It sure looks cool and is likely to be a big hit for those who can afford it and who want a transportable “tablet computer.” As for the other e-book makers? Well, I agree with the pundits who believe they will be iToast. But the iPad, or the iPod, or the iPhone, or the G-Phone aren’t chumbys and they don’t do what chumbys do. Not better, not worse, just not chumby. When you turn on a chumby-powered device, it plays your internet life – your chumby simply and automatically streams one application after the next. Perhaps your Flickr photos, then your friends’ Facebook status, then the headlines from The New York Times, then a wacky animated clock, then the weather, then whatever else you’ve chosen – and all with Pandora or podcasts playing in the background, so I guess it “multitasks.” It’s closer to turning on your TV or radio than booting up a computer and launching separate applications — chumby “just plays” your internet. As far as we know, no other device really does this. Related to 1) above, with chumby you don’t have to touch, tap, poke, stretch, flick, push or pull to get your information, you simply look at it. Sure, you can interact with chumby applications: flick photos, slide news headlines or blog feeds up and down, tap to see more, drag to share content with friends, tap to launch rockets, or whatever. But you don’t have to. As Chance the Gardener in Being There would say, “I like to watch.” With chumby, you watch your internet life go by. With other products, unless you interrupt what you’re doing to play with them, you stare at an “app dock” or a “desktop.” So I guess it’s sort of like the difference between watching your life on TV and watching your desk. At chumby, we have always been about embedding your internet life into consumer electronics products that you already understand — and just making them better and your internet more convenient. We make your clock radio better, we make your photo frame better, we’ll make your home phone and your TV better ;^) And we partner with big consumer electronic brands to make their products better. We believe that the things you already use every day should simply become internet-connected and more useful. The chumby one is the best “clock radio” in the world – and you probably already understand what a clock radio is and how to use it: we just reinvented it. So those are the big differences. Oh, and chumby products are also several times cheaper than the iPad. And chumby products are open and hackable so that you can do with them what you like or what clever developers can enable them to do. And chumby content is free — you don’t go to our App Store and buy anything: chumby is a free app buffet, so load up, take two plates. How is it free? Some chumby apps have a commercial rationale, say a new movie trailer or an app that is “brought to you by” someone — but that’s how free media works and is why this is the most broadly accepted media business model in the world. No purchases, no downloads, no data plans (please, no more of those! ), just free streaming personalized content where you’re in charge. As popular as our new chumby one has turned out to be, many of you love the chumby classic, our original iconic bundle of always-on hand-sewn Italian leather stereo goodness. There is nothing else like it, and there may never be. It’s what I choose for my own bedside table. 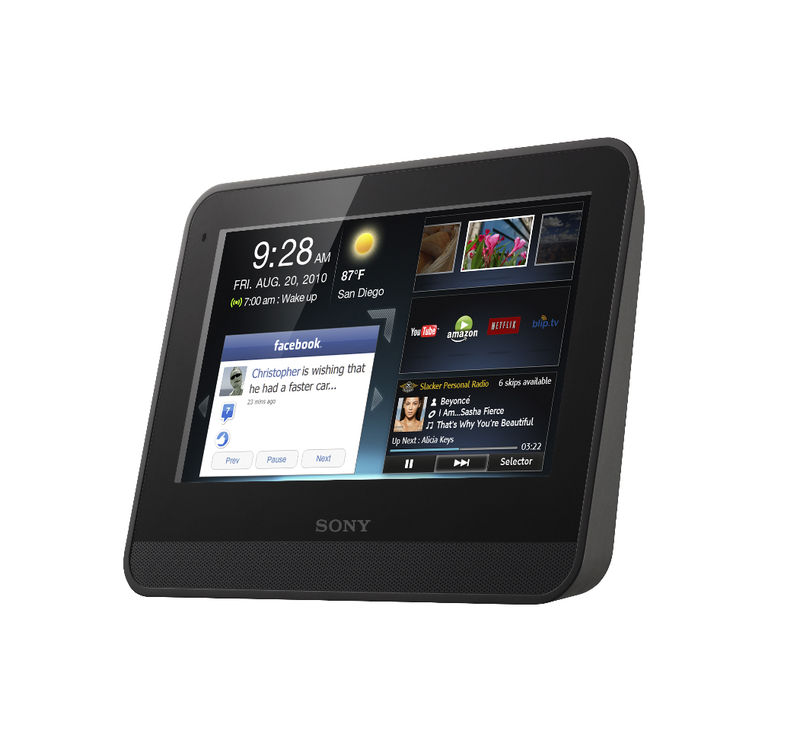 Sony dash announcement today at the 2010 Consumer Electronics Show: here.